Pixar can be credited with taking it's time between monster box office hits for the studio, not simply due to the time consuming animation process it champions, but because they are truly interested in character and storytelling. So it is not exactly hot on the heels of the 2001 hit Monsters Inc that we have the Monsters prequel Monsters University. How did Mike (Billy Crystal) and Sully (John Goodman) first meet is the jumping off point of this prequel. 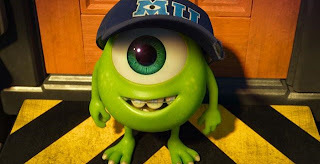 Concentrating more on Mike than Sully, Monsters University shows how Mike was inspired to become a Scarer, his first few months of university life and getting to know Sully. Kids will recognise the University campus as just a more elaborate playground with all its playground politics. Adults will enjoy the stalwarts of university freshers week and finding yourself in an adult world with dreams of your life to come. When Mike and Sully hit stumbling blocks to their Scarer dreams in the form of the brilliantly named Dean Hardscrabble (Helen Mirren) and the reality that life does not always work out exactly as you have planned. Monsters University is visually a joyous explosion of blue, purple, yellow, pink and green with ever inventive benign yet scary monsters. The film's basic story of the need to work together and that everyone has something to contribute is a sweet one looking to shake off the tag of who is 'cool' or 'uncool.' The voice work especially from Billy Crystal and John Goodman is always entertaining. Adults can enjoy/torture themselves as to who is behind the impressive voice cast along with the knowing nods to college life and the quirks of the Monsters world. Though the script is funny, it is more along the level of warm smiles than providing all out constant laughter. There are some standout moments, but a lull to deliver the film's moral punch does slow the film down significantly after it's bubbling first and second acts making it's near two hour running time feeling on the lengthy side. A pleasing and pleasant return to the Monsters universe, Monsters University can certainly sustain multiple viewings without the need of having seen Monsters Inc though it does wet the appetite for it's predecessor.